Also, see microscopic creatures moving body parts up close as well as cells duplicating. Our waters hold secrets yet to be discovered. There is always life where is should never be. Here, this deep sea life can only be described as alien. Climate models are now predicting a "staggering" catastrophe for deep sea marine life — a stark warning that even our planet's most remote ecosystems are not immune from the ravages of climate change. The new study, led by the National Oceanography Centre, used various climate models to predict changes in food supply throughout the world's oceans. The scientists then looked at the relationship between food supply and biomass. Grimly, the models predict a 38% decline in seafloor-dwelling marine life in the North Atlantic, and 5% globally, by 2100. In addition, the models suggest that more than 80% of all identified key seafloor habitats — like cold-water coral reefs, seamounts, and canyons — will suffer losses in total biomass. 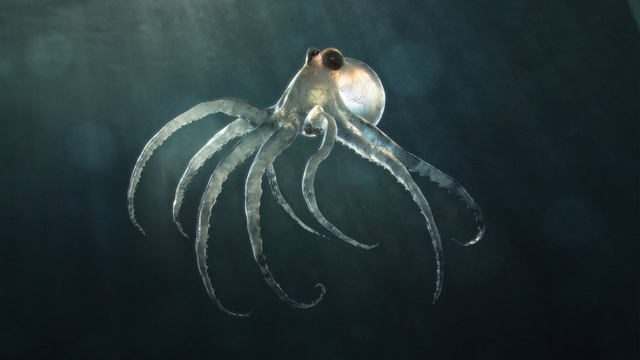 The scientists also predict that marine organisms will get increasingly smaller. are projected to suffer major declines under the latest climate change predictions. "There has been some speculation about climate change impacts on the seafloor, but we wanted to try and make numerical projections for these changes and estimate specifically where they would occur," noted lead author Daniel Jones in a statement. The changes to seafloor life will happen despite their presence, on average, some 2.5 miles (4 km) below the ocean surface; what happens up top will have a dramatic impact on the so-called bottom-feeders lying below. Deep sea creatures depend on the remains of surface ocean marine life sinking to the bottom. But life at the surface is set to decline, owing to a sharp decrease in the availability of nutrients — which will be caused by climate impacts like the slowing of global ocean circulation and stratification (the increased separation between water masses). Global Change Biology: "Multi-decadal range changes vs. thermal adaptation for north east Atlantic oceanic copepods in the face of climate change."